(P1) INTERNSHIP programs are now well UNDERWAY on WALL STREET, and the RESIDENT office ROOKIES are finding out the truth about their PRESTIGIOUS jobs. (P2) We’ve all heard HORROR STORIES about SLEEPLESS nights at the office. (P3) But what are things really like for this year’s CROP of summer ANALYSTS? (P4) One INVESTMENT BANKING intern told us his days were usually PACKED with BUSYWORK, which is never very TOUGH. (P5) The intern spends most of his time RESEARCHING POTENTIAL companies that his team might be interested in working with and helping to write company PROFILES. (P6) A big project for him may involve making a PowerPoint presentation for more senior bankers on his team. (P7) Even then, his DEADLINES are not very TIGHT. He is able to RUN EVERYTHING BY the first- or second-year analysts before anyone more senior sees his work. (P8) That may sound DISAPPOINTING for, say, a STRAIGHT-A student with a background in finance and experience building complex CASH FLOW models. But it does keep the interns busy. (P9) The analyst we spoke with said he was staffed on a project at 10 a.m. on his very first day — and another that evening. 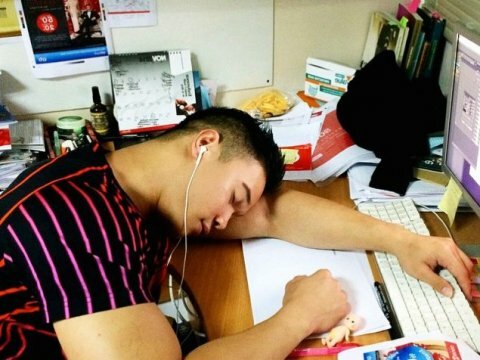 He WOUND UP working until 2:30 a.m. his first night. (P10) Most days, however, he leaves by 10:30 or 11:30 p.m., and he is not expected to work more than one weekend IN A ROW. (P11) So not quite the 100-hour workweek you may hear about for young Wall Street interns. But still not enough time to go out to the bar every night. (P12) That, the intern said, he RESERVES for Friday and Saturday nights. Did you ever work in an internship or APPRENTICE program? Why have these programs become so popular with university students? At many companies, interns are used mostly as GO-FERS. Is this UNFAIR, or is it still VALUABLE experience? Many internships are UNPAID. Does this give too much of an ADVANTAGE to students whose parents are wealthy and can afford to support them living in expensive cities like New York and Tokyo?